Bio: JoEllen received a BFA in medical illustration from the Rochester Institute of Technology in 1979, and began her career at the Boston University School of Medicine where she illustrated medical textbooks for four years. For twenty-four years, she was an artist at the Washington Post, where she won numerous awards from PRINT, the Society of Newspaper Design and the Art Director’s Club of New York for both illustration and design. 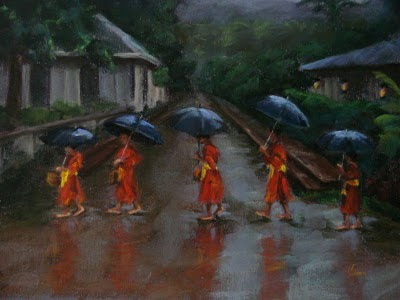 More recently, she has been accepted into numerous juried shows and has received national recognition for her pastels. She also came in first place (the artist’s choice award) in a plein air competition in 2007 through the Yellow Barn studio in Bethesda, Maryland. She has taken workshops with Richard McKinley, Susan Ogilvie, Margaret Dyer, Doug Dawson, and Wolf Kahn. She has also taken oil painting classes with Jill Phillips and Susan Yanero at the Washington Studio School (focusing on the figure and still life) and has studied with Glen Kessler and Walt Bartman at the Yellow Barn Studio at Glen Echo. She is a juried member of the Pastel Society of America and a juried signature member of the Maryland Pastel Society. JoEllen is also part of the Columbia Pike Artist Studios in Arlington. JoEllen lives in Washington DC. 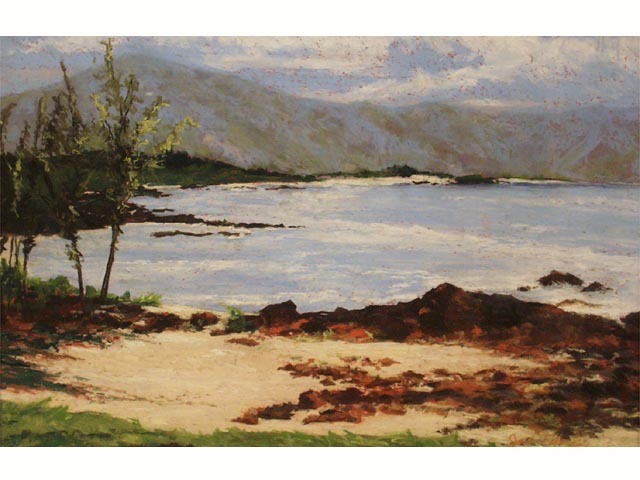 Gallery: Studio Landscapes; Plein Air Landscapes and Interiors; Figure Work. Image View: The large thumbnails enlarge in a new page and may be saved. At their peak is 6 x 20 ins. Bio: I have little biographical information on this New England artist, apart from the fact that she lives in Provincetown, Cape Cod. She also spends time in Santa Fe, New Mexico. 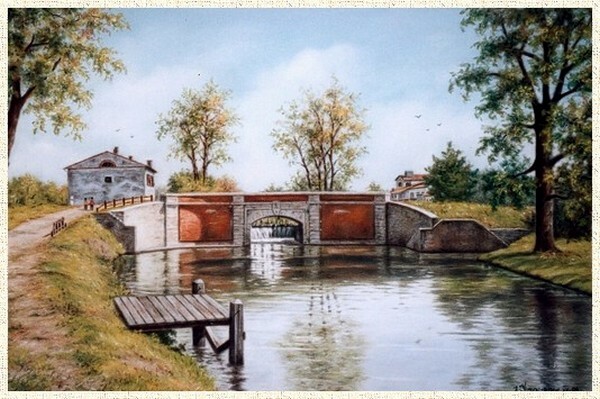 Nancy is part of the daily painters movement and her work may also be seen there. Style: Representational. Many, if not most, are plein air. Navigation: Website is easy to navigate, with main menu available at side. Gallery: Water gallery; Land gallery. Image View: The thumbnails enlarge in a pop-up when clicked and you can proceed forwards or backwards through the enlarged images. Download is not blocked. Images are labelled with information on medium and dimension. Hatches Harbour is 9x 12 ins. 746 x 550, 296 KB. Bio: Valérie Genty studied and worked in different arts fields in Paris, including photography and graphic arts. After two years in Indonesia she progressively devoted herself to sculpture, oil and pastel painting. Her work is primarily figurative with a surrealist interpretation, taking inspiration from music: the spontaneity of jazz, and from views of Paris that inspired her first series of "Roofs of the World". 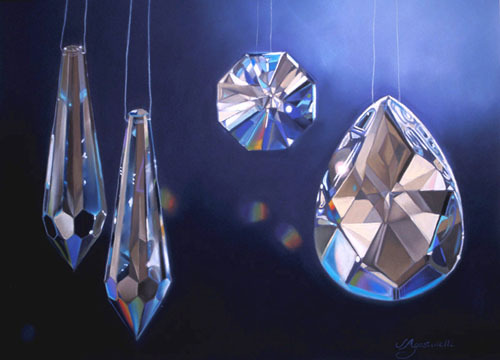 Dinelli has exhibited in her native France; Poland, China, Russia, Japan and Canada.She was awarded the Grand Prix d’Honneur at the 2003 Biennale Internationale de Peinture – followed in 2004 by an award from the American Pastel Society at the National Arts Club in New York. She is a member of Figuration Critique ; and of SODAL. 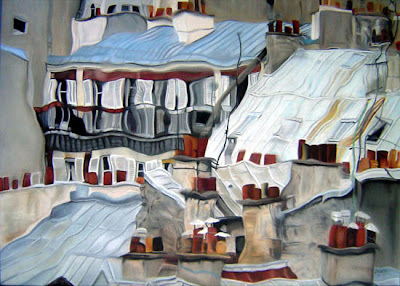 Her work and methods were featured in Hors Series No. 17, June 2009 issue of Pratique des Arts. Medium: Pastel; Oil; Wood; Bronze; Clay. Navigation: Website is in French and in English. Gallery: Creations: Wood; Bronze; Clay; Pastels. Image View: The pastels gallery has an arrow in the centre that allows you to scroll through more thumbnails – don’t miss it, or you will only see four images. Clicking on these causes them to enlarge in a pop-up, whence they may be saved. Dimensions are not given, nor medium (you are after all in the pastel gallery and those in oil are noted). Sizes are generally about 65 x 50 cms. Blog: http://dinelli.blog.free.fr/ does not seem to have been updated since 2007. Bio: Elsie Dresch marked a milestone in March, 2010 with the opening of her one-woman show of oil and pastel paintings at Watson Gallery in Midtown, Atlanta. An 85th milestone, to be exact, that celebrated Elsie's 85th birthday. What is perhaps even more remarkable is, rather than show a retrospective of her lifetime’s work, Elsie displayed 85 recent paintings. Elsie's art education began in Philadelphia at 13, when she studied at the Graphic Sketch Club then attended the Fleisher Memorial School of Art in addition to studying with several contemporary artists in workshops throughout the southeast. 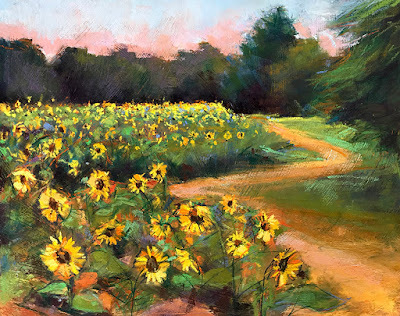 She is a Member of Excellence of the Atlanta Artists Center and of the Southeastern Pastel Society and a Signature Member of the Pastel Society of America. She has received over 60 awards in regional and national shows. 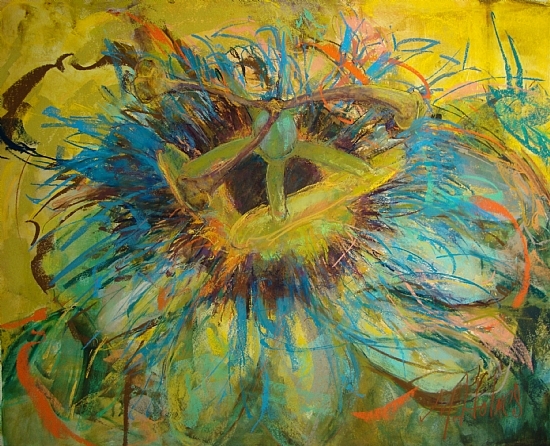 Her work is in many private and corporate collections in the United States, Canada and Italy. She is represented in Atlanta by the Watson Gallery and in Blue Ridge, Georgia by High Country Arts and Antiques. Elsie is the mother of artist Janet Mozley. Image View: The single gallery page consists of thumbnails that enlarge on a new page when clicked. Rainy Day in London is 18 x 24 ins. Bio: New Hampshire artist Robin Frisella took her first pastel class in 2000 and has been exhibiting and winning awards ever since. Her first piece won Best of Show; it was a "eureka" moment. 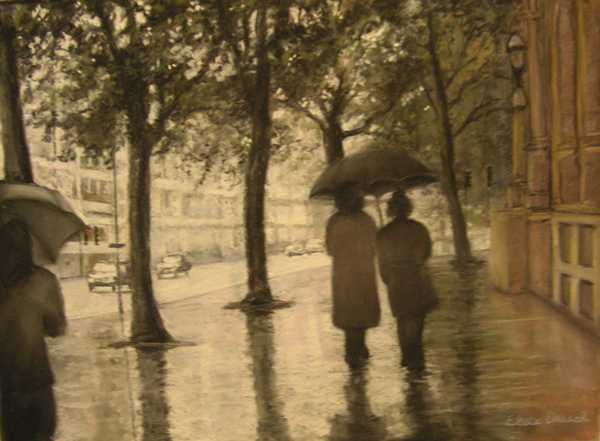 By 2005 Frisella had left her job to pursue her art career full time. She has continued studying with local artists and teaches the medium to a keen following of students. In 2006 Robin opened Frisella Fine Art Studio in Candia, New Hampshire. Her work has featured in a number of publications, including American Artist Magazine, May 2010 and September 2009; and in Best of American Pastels Volume II, Kennedy Publishing, 2009. Medium: Pastel. One hint I picked up from Frisella, who works on several paintings at a time, is that when finished she lays sheets of newsprint paper over the top and applies heavy weights to press the particles of pastel into the support (she uses Wallis). Subjects: Still Life; Portraits; Landscapes. Gallery: Still Life; Portraits; Landscapes. 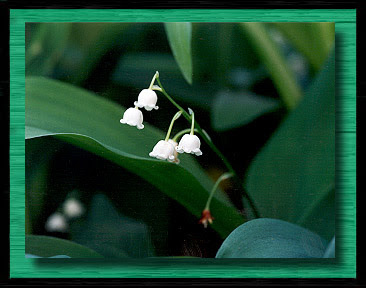 Image View: Each gallery consists of thumbnails which may be clicked to enlarge on a new page. There is no information on the dimensions of the original work. The image can be saved. As with all artists whose work is excellent throughout a range of subjects, choice of a single image typique is always going to be tough. 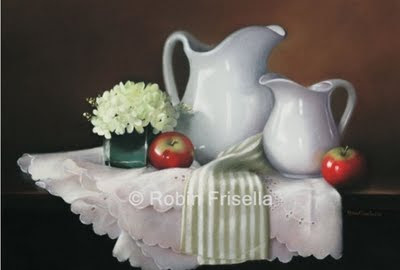 I think Frisella is perhaps most keen on still life, so I have chosen Sweet Memories which I know is 12 x 18in as it was published in American Artist. Bio: Paul Dumestre was born in 1974 in Périgueux, France. He started his professional career as a chemist, converted to IT and has been employed therein since 2001. 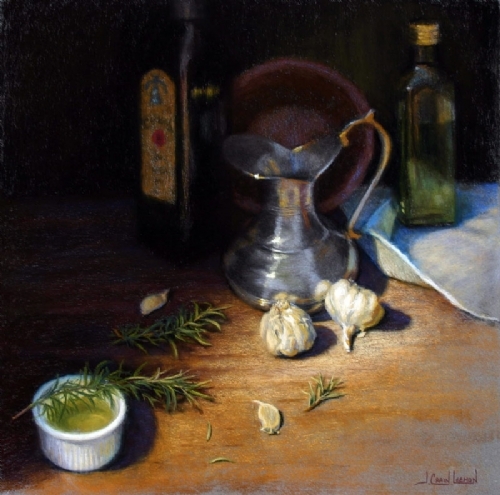 For fifteen years he has been painting still lifes, at first in oils, but since 2005 in pastel. He has taken workshops with master pastellists Lionel Asselineau and Chris (Serrurier). 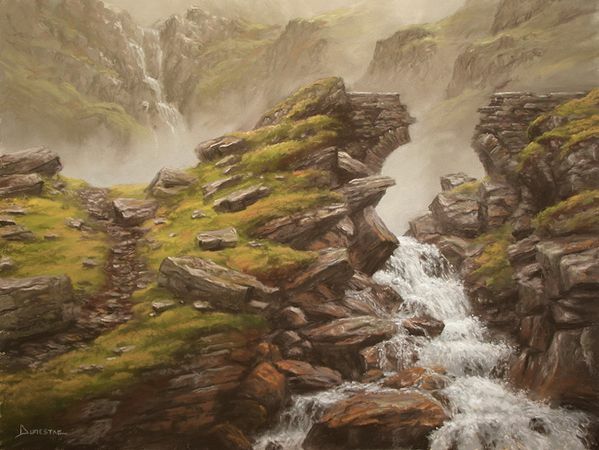 His landscapes are based on the mountains of the Bigorre, but with more than a nod to fantastical composition. Paul Dumestre has been showing his work since 2001. His pastels will be included in the Société des Pastellistes de France at Feytiat this July (I have already given notice of thsi exhibition) and also at St Aulaye in the Dordogne from the 13th to the 28th August (Salon Pastel en Perigord). Paul Dumestre naquit en 1974 à Périgueux. Il a fait des études de chimie mais il s’est reconverti depuis quelques années dans l'informatique. Peintre amateur depuis une quinzaine d'années, son domaine de prédilection est la nature morte réaliste. A l'origine, il travaillait essentiellement à la peinture à l'huile, mais depuis quelques années, il utilise beaucoup le pastel sec. Aujourd'hui il réserve l'huile au trompe-l'oeil. Parallèlement, il réalise donc au pastel des natures mortes plus classiques ainsi que quelques paysages (de montagne principalement, traités sous une approche un peu fantastique). Navigation: Website is in French. Main menu remains on top. Gallery: Natures Mortes (Still Life); Figures; Paysages (Landscapes); Divers & Fantasy (Tolkien casts a long shadow). Image View: Each gallery consists of thumbnails that open in a Flash viewer when clicked. Download is not possible. The galleries are grouped per medium, over a numbner of pages – all the oils paintings are together, likewise the pastels. Pont Brisé is 40 x 30 cms. Bio: Sonja A. Kever grew up in Northern Iowa and from an early age had aspirations of being an artist. She was a fine art major at the University of Kansas but transferred to and graduated from the University of Missouri with a B.S. in Fashion Merchandising. Careers in fashion, as a child welfare supervisor, and paralegal followed. Her art career was all but forgotten as she married and reared two daughters. In 2003 she attended a pastel exhibit at the North Hills Gallery in Austin, Texas and was awed by the luminous medium. Having had no previous experience with pastels, she immediately began taking lessons, attending workshops and pastel exhibits. The artist with whom Sonja has taken workshops is a veritable Who’s Who of American pastelists: Desmond O’Hagan, Judith Carducci, Claudia Seymour, Denise Larue Mahlke, Eve Larson. John Roush, Libby Peters, and Jim Cox. Sonja is a juried associate member of the American Pastel Society, a signature member of the Pastel Society of the Southwest, and is also a member of the Pastel Societies of Austin, Texas, Central Texas respectively, the Portrait Society of America, and the Capitol Art Society. Navigation: Main menu on top. Very easy to navigate this site. Bio: Born 1966, and native to the San Francisco Bay Area, Kim Lordier graduated from the University of San Francisco, with a BFA Illustration in 1989, and from the Academy of Art University, San Francisco. After college, Lordier flew for a major air carrier, which gave her the advantage of being able to experience many domestic and foreign locations, all the while keeping up with her painting. 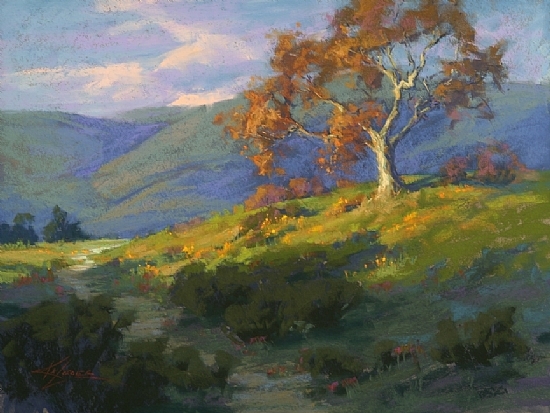 She switched careers late in 2001 in order to spend a year at the California Academy of Painters, and she continues to study occasionally with master pastellist Bob Gerbracht. She is currently a Signature member of the Laguna Plein Air Painters, the Pastel Society of America, a Distinguished Pastelist in the Pastel Society of the West Coast, and Artist Member of the California Art Club. 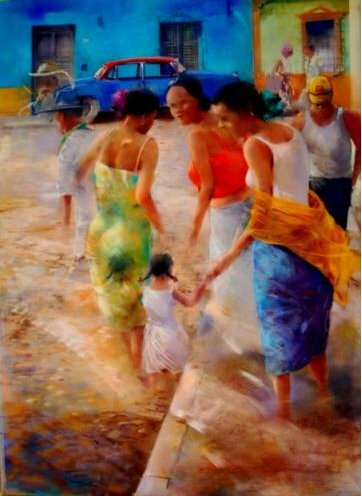 She has won many awards including the Pastel 100 Grand Prize in 2007. Kim has been featured in the Pastel Journal, American Artist, American Art Collector, and Fine Art Connoisseur, among others. Style: Impressionistic; Kim paints in the plein air tradition. Navigation: Main menu remains at side. This is a FineArtStudioOnline website. Gallery: Works: California Interior Landscapes; Coastel; Desert, Southwest and Colorado; High Sierra. Image View: Click on thumbnails to enlarge in viewer, with full details. Download is possible. Illuminated is 18 x 24 ins. 550 x 413, 208 KB. Bio: Sometimes I stumble upon an artist who is outside the mainstream of "pastel artists" in the sense that the medium is not necessarily the message, to paraphrase Marshall McLuhan. Ian Ingram is one such artist, and is featured on this blog because he does make extensive use of pastel in his work. Ian Ingram was born in 1974 in Atlanta, Georgia. He is a graduate of the University of Georgia, but also attended Washington University, St. Louis, and Temple/Tyler Art School, Rome, Italy. Ian Ingram currently lives and works in Austin, Texas. Cross contours, grids, and blending build the subtleties, nuances, and porous surfaces of the human face. Working with a base of charcoal, pastel, ink, and watercolor, Ingram has also begun incorporating more unconventional materials into his work, such as beads, beeswax, metallic thread, silver leaf, string, and even butterfly wings. “My husband, ian, is an artist. his current work is a series of charcoal self portraits – intense and magnificent – that are 7 feet high and 5 feet wide. he starts with a big white paper and spends 3 focused months creating each piece. using his hands or sponges or self-made tools, he rubs and grinds charcoal into the paper’s surface. I am continually astonished by what he can create out of burnt wood and white paper. Gallery: Work: New Work; Divining. Image View: Images are displayed in a viewer above a series of thumbnails. The main window of the viewer acts as a magnifier of the piec e; which is an essential part of the experience given the huge scale of Ingram's work. 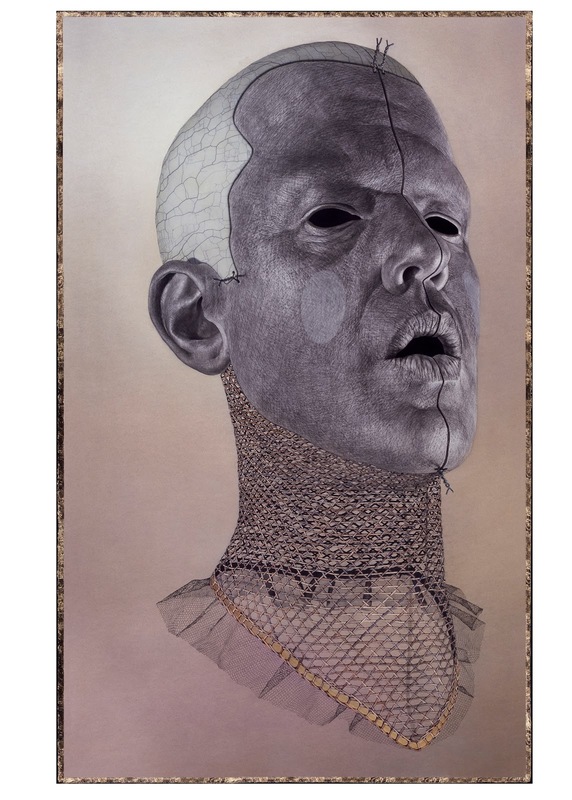 The painting featured here, Pierrot, measures 82.5 x 51 inches, and is made of Charcoal, pastel, watercolor and gold leaf. This is the biggest file I have uploaded to date, at 3.25 MB.